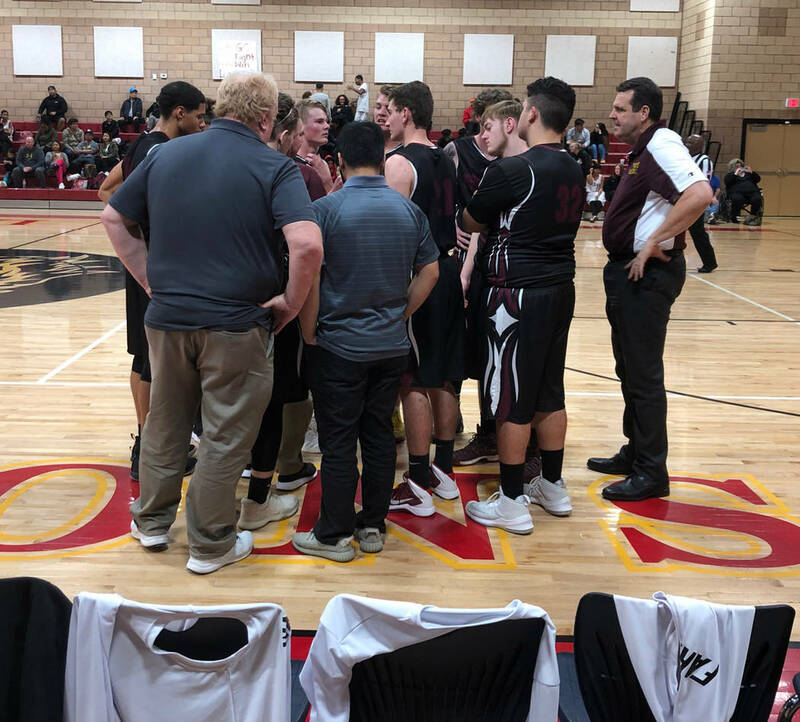 Senior Brayden Severt led three double-figure scorers with 15 points Tuesday night as the Pahrump Valley High School boys basketball team snapped an eight-game losing streak with a 59-36 win over Lake Mead Christian in Pahrump. Tom Rysinski/Pahrump Valley Times The Pahrump Valley High School boys basketball team huddles up during their 61-56 loss to Somerset-Losee on Monday night in North Las Vegas. Tom Rysinski/Pahrump Valley Times Senior forward Chance Farnsworth goes up for a shot against Somerset-Losee on Monday night in North Las Vegas. Farnsworth led the Trojans with 18 points in a 61-56 loss to the Lions. Junior guard Grant Odegard totaled 13 points, senior forward Chance Farnsworth scored 10 and senior guard Ethan Whittle added nine for the Trojans (5-16, 0-6 Class 3A Sunset League), who won for the first time since defeating Nuview Bridge of California in the Vegas Invitational on Jan. 5 at Mountain View Christian. The Trojans outscored the Eagles (10-7, 6-4 2A Southern) in each quarter. The win was especially important because the Trojans had been in their previous two games deep into the fourth quarter before losing. Especially gratifying to Clift was that his three top scorers had good games on the same night. The win helped ease the sting of a tough loss the night before at Somerset-Losee. 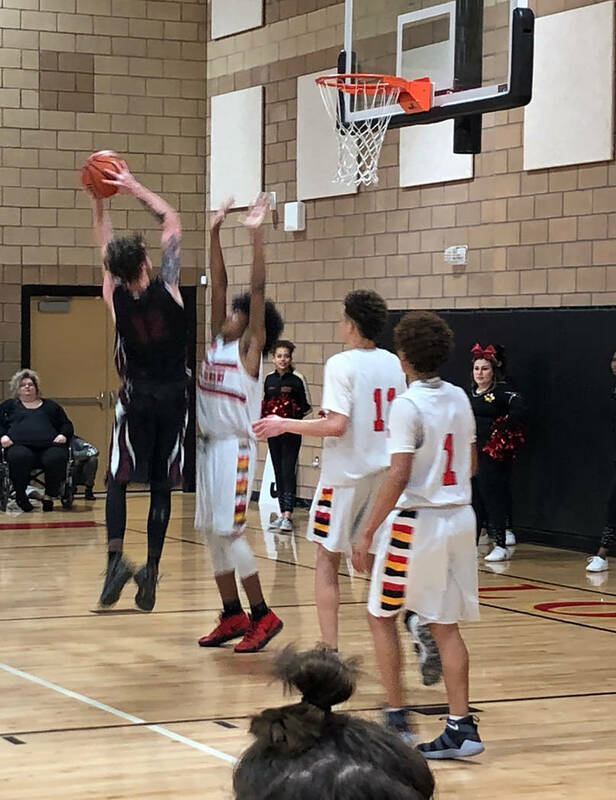 The Trojans defeated the Lions 49-46 on Dec. 13 in Pahrump, but the Lions were a different team with junior guard Ray’mon Daniels on the roster. Daniels lit up the Trojans for 25 points as the Lions scored 14 of the game’s last 17 points to take a 61-56 victory. The Trojans led 53-47 on Garrett Ward’s 3-pointer with 6:47 remaining. “The big difference is No. 11 (Daniels) played on the JV the first time, and he had 36, maybe 33 points on the JV,” Clift said. “He joined the school just before the semester and they had to wait until the new semester to bring him up. Farnsworth scored the team’s first 8 points and finished with 18, while Whittle poured in 17, including three 3-pointers. “That’s the best Ethan has played all year,” Clift said. The middle two quarters were mostly quality basketball for the entire team, as the Trojans put up 35 points, well above their norm. The third quarter saw them put on a shooting exhibition with four 3-pointers, including two by Whittle and one each from Odegard and sophomore Logan Gavenda. In addition to his 18 points, Farnsworth, who has a habit of picking up quick fouls, had Clift raving about something on the defensive end. So while a lot of good things happened Monday night and the previous Thursday when the Trojans led 28-22 after three quarters only to lose for a second time this season to Valley, 45-41, but these three games were circled for a reason. “We need to win these games,” Clift said. “They’re the ones on our schedule we really want to play well and work toward in practice. I think some teams like Mojave it doesn’t matter what we do, they’re going to be a handful for us. But a team like (Losee), we handled whatever they threw at us. The Trojans go back into the Sunset League fire Tuesday when Del Sol (12-10, 3-3 Sunset) pays a visit.